The Sequetus Series is big. It is about the subversion of a galaxy, this galaxy and all the civilizations in it. The book starts off when an intelligence officer from out there is directed to go on a mission to Earth, known as Sequetus 3. He is to investigate why there is such an anomaly with this one planet. For some reason the planet is way overdue its Intervention Day. The planet governments insist that the visitors they get from out there absolutely do not exist. Yet half the population believe that they are not alone, in the galaxy. The planet also has a short lived population, and instead of the normal 325 years, people from Earth live only 75 years. There is no explanation for that. Also, the technology on the planet is advancing way faster than normal self-generated technological advancement. This is very suspicious. The planet a long time back was said to be a prison planet. ……….Furthermore, its population has only been there a few thousand years, and the planet is ready to blow itself up. It is 1989 and the cold war is in full swing. But why war? Don’t nations usually solve their disputes, peacefully, unless someone outside has an interest in war? 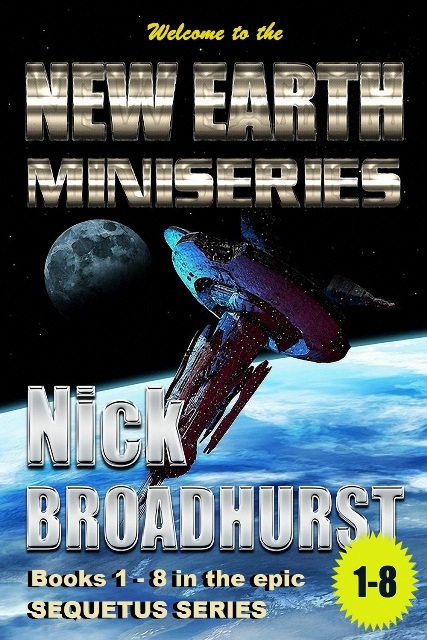 Here are the complete eight books of the New Earth Miniseries, which are the first eight books of the epic Sequetus Series. This is a big miniseries. Like the Galaxy, this is a big story. 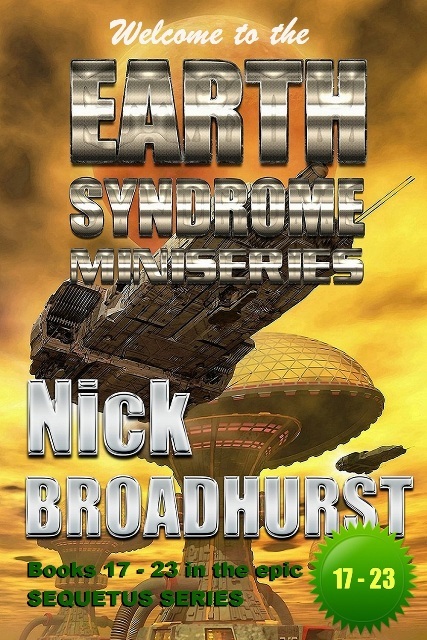 This is a story of an intelligence officer, who gets sent to Earth, to work out why this planet has not had intervention. The date is 1989. This fact does not make sense to him or his patron. There are obvious contrary facts to the planet. For a start the Earth’s people are short-lived. They live only 75 years or so, and die. Out there people live five times that, and some even longer. Also, the planet has been visited many times over the past thousands of years, but those running the planet hold to the line that the visits never happen. This just does not add up. Plus, to make this more mysterious, there are shipments of something coming out, off from the planet. 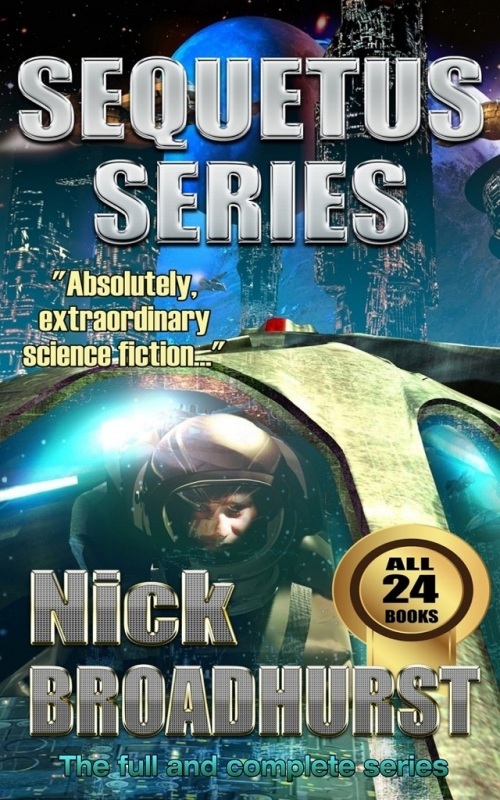 Here is the second miniseries in this exceptional science fiction epic, the Sequetus Series. The first miniseries, the New Earth Miniseries, details how Goren Torren, an agent sent to Earth, was to prepare an intelligence estimate on the affairs of the planet, back in 1989. He was confronted by a planet about to incinerate itself in global atomic warfare, a population of exceptionally short lived people, and an escalating technology that was advancing so rapidly, none of it made any sense. The worst was that while there were many extraterrestrial visits, mostly sanctioned by out there, they were denied by the local Earth governments. To boot, there were illegal exports coming off from the planet too. This is when Goren Torren entered the scene. The planet is run by people unknown, who operate higher than the governments representing the people of Earth. To find out what was going on, Goren had to get known, and that he did. He began a business empire, and it boomed. He introduced a philosophic teaching, after being introduced to one from out there himself. It eased Earth tensions. Both these actions seemed to catch the eye of someone, and he and his followers were attacked both in the corporate and media sense, until he was assassinated outright. “THIS TAKES SCIENCE FICTION OUTSIDE ANY REALITY…. 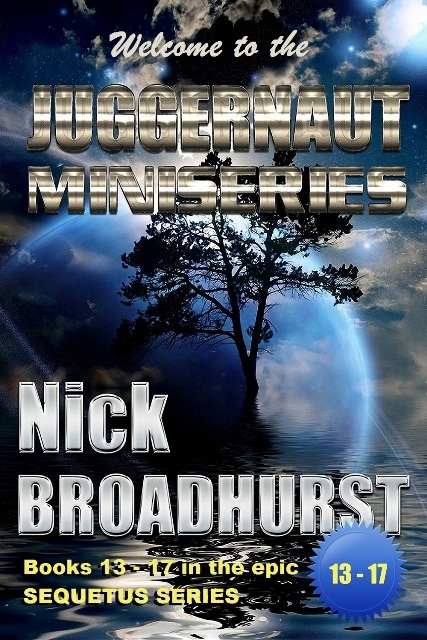 The Juggernaut Miniseries is the third miniseries in the epic Sequetus Series. By now the true enemy of all galactic civilisations has been exposed. There is a group out there, found to have been manipulating the civilized planets, including Earth, for thousands of years. They have a name, and that name is Talkron. They use secrecy and cabal to create war between potential opponents. To rule, they want all weakened. So one planetary system pitted against another, is how they work. They profit by war. The galaxy is a tinder box of short-lifers, originally from Earth, and the established older-lived humanity who reside through much of the galaxy. These two groups are being pushed to fight each other. However, there are other forces in the galaxy, whose purpose is to push civilisations down a better peaceful path. That group of forces is uniting against what has become an otherwise hopeless decaying and depraved lot of civilizations. “THIS FOURTH MINISERIES IS AN AMAZING CONCLUSION. IT MAKES SO MUCH SENCE. The events have swung full circle as the Talkron, those subverting the Galaxy; have been found to be still stationed near Earth. Moreover, it is also found where they originate from, and what other galaxies they have penetrated. This miniseries takes you there. It is brilliant. It covers the theory of time travel, faster than light travel, and more. Previously telepathy was covered, and is part of the miniseries, as is telekinesis. You will not be the same after you read this book, absolutely. This one is a mind bending blow out! The universe out there is not glossy. All the galactic civilisations are not there to enlighten you to some amazing supernatural state. Some are maybe, but there are others, which have a destiny to enslave you. Learn which is which, and where they come from. There are dozens of pictures and photos from dreamstime.com, as in earlier volumes, plus there are maps and sketches to also help you. Plus there is an awesome glossary, so you can fully understand all new terms. There is a large notes section, giving more background behind the story. Learn more about Earth, and what is in this system around us. Learn about the nearby galaxies, very close to us, and far away. Learn about their influence on this galaxy, this system, this planet. The planet also has a short lived population, and instead of the normal 325 years, people from Earth live only 75 years. There is no explanation for that. Also, the technology on the planet is advancing way faster than normal self-generated technological advancement. This is very suspicious. The planet a long time back was said to be a prison planet. Furthermore, its population has only been there a few thousand years, and the planet is ready to blow itself up. It is 1989 and the cold war is in full swing. But why war? Don’t nations usually solve their disputes, peacefully, unless someone outside has an interest in war? A l l 2 4 B o o k s o f t h e s e r i e s , i n t h i s o n e d o w n l o a d .
N o w $ 1 3 2 . 7 7 U S D f o r a l l 2 4 b o o k s .
Without giving the plot away, our officer has to prepare an intelligence estimate on Earth and return. Will the galaxy out there feel threatened by these short-lived, and fast breeding races of Earth? What will happen if this humanity gets off the planet? The first few books are to build the reader’s universe. They get you familiar with the characters. Then in the fourth book, Magi, the plot kicks off, and you better hold your hat. Here is where you get introduced to telepathy, telekinesis; and even if you do not believe it, it exists, and it is in this book. To have faster than light speed travel, one needs to work out exactly how can a person and ship travel faster than light. There is a way, and that is outlined in the story, but in the later books. Plus, to do this, it is needed to look at what is the physical universe, and what is its true makeup. To be exact, the author reconstructs space and its so-called vacuum, and what it really is, and the properties that space has. It is not nothing. Space isn’t just nothing. The current models used by science just do not quite fit, so this is taken up in what is termed Broadmatter Theory. Next is time travel, and this is introduced to the reader in several stages. The first is to be able to project oneself to an earlier or later time to when one is, so as to alter one’s mind in that other time. This is déjàvu in this book. Next is to take one’s body through time itself. This also leads to an examination of how the universe works, and how this can work with time. So, with all this nutted out, as well as how to access these otherwise very above normal human abilities, the background is set for our character to solve what ails not only Earth but every major civilization out there in this galaxy. As to the story, it could have you weeping one moment and laughing the next. Some of it is bloody, as space opera is just that. The story spans over a thousand years. The characters are very real, so let the author build up their worlds around you. It is an excellent yarn with a brilliant plot. This story has never been told. It is absolutely unique. So, enjoy it. There are hundreds of illustrations and maps, a large glossary, with pages of references and notes in the back matter. Expand the sample illustrations below, for a fuller viewing experience. They are from the New Earth Miniseries. The first line of illustrations is from the story, while the second line of smaller pictures is from the glossary, showing the background behind the story. Have you ever wondered if man returned to the moon? Are there more UFO sightings today than before? You seldom see such sightings on mainstream media. Are those sightings really prevalent? If real, why don't those external civilizations announce themselves? What could they be doing out there in relation to us? These books really are amazing. I read all four miniseries. They were hard to put down. I also found the series to be a lot of fun. And I further found the books very thought-provoking. There is a lot of profound philosophy written here. This is not from just another sci-fi writer. These books have an edge to them, like some of the science fiction classics. I think of Herbert and Heinlein novels for obvious similarities. Maybe Donaldson is another. I have not had such a read like these for many years. Out there this planet Earth is known as Sequetus 3. For many on Earth they have no question of their origin, what they are doing, or if there is more to life than their life insurance policy. That is the way it has been planned and that is the way it has been, and that is the way it is meant to be in the future. However, for some out there they want to know why this planet has not been intervened and its neighbors introduced to it. They want to know why the people of this planet live an unnaturally short life. They want to know why the planet is off limits to the rest of the civilizations out there. 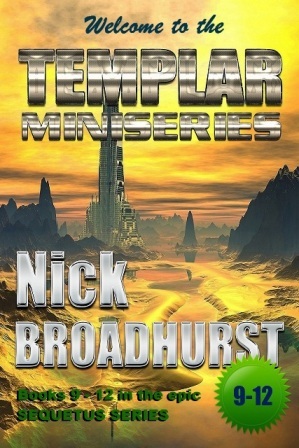 This miniseries picks up over a thousand years after the NEW EARTH MINISERIES. Sequetus 3, Earth has been denuded of its population. Something has happened. Almost all people have vanished from the planet. Yet out there the short-lifers, those whose forebears came from Earth, are setting up a religion based on the works of that earlier intelligence officer who came to Earth in the preceding series. This miniseries picks up where the preceding books finished. The galactic war is over. The oppressive force is gone that was running things, that was trying to oppress the short-lifers from Earth, and their religion. Yet, there are indications things are not as smooth as they should be. The decedents of that intelligence officer sent to Earth in the NEW EARTH MINISERIES are now active, searching for the answers that their ancestor had failed to find. There was a force back then, running Earth, from the moon, that has a presence all through the galaxy. Those answers that were sought back in 1989 were never really found, but it is evident now there is another group behind all the others. This miniseries is the climactic finale of the Sequetus Series. If you began reading this series, and you now have all the information on what is happening out there, you are ready for the final answers to the original quest of Goren Torren, this is the miniseries you definitely need to read. Here is the information he missed when he wrote that intelligence estimate in 1989. Why was Earth the way it was, why was it not like out there, and other galactic civilisations? All the way through this series you have been given data, supplied information. Now read the final books that put it all together for you. Just make sure you read the earlier miniseries first. For an additional tip, so you do not miss out, each entry in the glossary, the footnotes, the references and the general notes too, are all there for a purpose. Good luck!